RPF Sub Inspector SI Post Result Check Here. RPF Constable Post Result Check Here. RPF Constable Group C+D Answer key Phase 5 Check Here. RPF Constable 2018 Admit Card Check Here. RPF Constable CBT Exam Schedule 2018 Check Here. RPF Exam Date Notice Constable 2018 Check Here. RPF Notification is out. RPF is recruiting for 8619 Constable 2018 Govt Job Posts. You can check RPF - Railway Protection Force last date, download RPF notification, visit RPF official website and check other RPF Vacancy details.Complete Vacancy and recruitment Details about 8619 Constable 2018 Govt Job vacancies in RPF are provided below by JobSarkari.Com only for you. Last Date For Submit Complete Form. 16/07/2018. Rs. 250/- will be refunded on appearing in CBT. Candidate Must have Passed 10th Class. Running. Male. 1600 Meters in 5 Minute 45 Second. 1600 Meters in 5 Minute 45 Second. 1600 Meters in 5 Minute 45 Second. Female 800 Meters in 3 Minute 40 Second. 800 Meters in 3 Minute 40 Second. 800 Meters in 3 Minute 40 Second. Long Jump. Male. 14 Feet (2 Chances). 14 Feet (2 Chances). 14 Feet (2 Chances). High Jump. Male. 04 Feet (2 Chances). 04 Feet (2 Chances). 04 Feet (2 Chances). Age Relaxation. As Per Rules. Q. 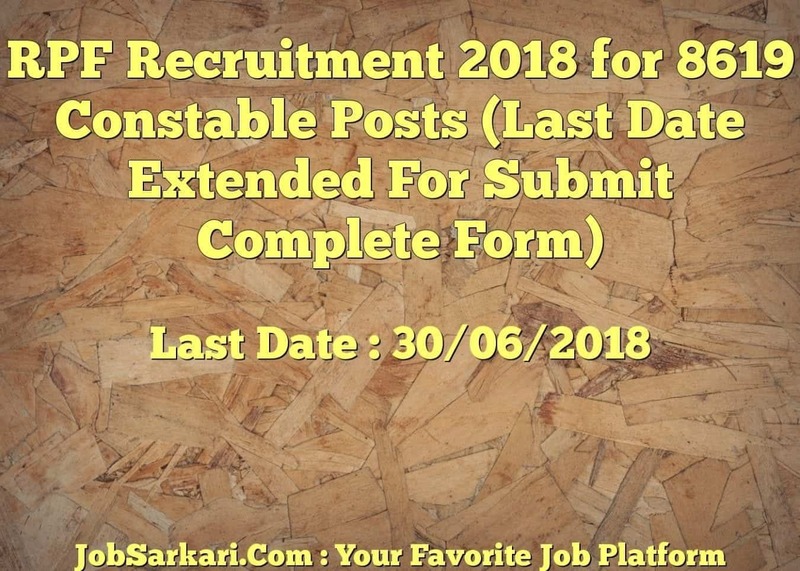 What is the Last Date For RPF Constable 2018 Govt Job Vacancy ? A. 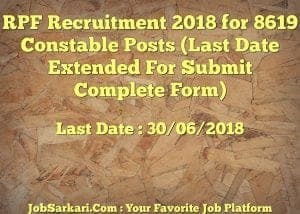 Last Date for RPF Constable 2018 Govt Job Posts is 30/06/2018. Q. What is the Form Type of RPF Constable 2018 Govt Job Recruitment ? A. The Form Type for RPF Constable 2018 Govt Job Posts is Online. Q. How many vacancies are available in Railway Protection Force Constable 2018 Govt Job Posts ? A. There are about 8619 Vacancies in Railway Protection Force Constable 2018 Govt Job Posts. I want to apply in RPF constable. But it’s time is over now. Please tell how can I apply now ?